We need content! If you're a Canadian writer/artist, we'd like to share your work. Email me for more info. Disclaimer: This site, the artwork, and fanfiction is all non-profit. There are no monetary exchanges amongst the archivers, the artists, or the audience. This site is an archive of ideas being shared amongst people who have a common interest; Stargate SG1. 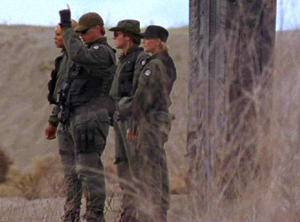 Stargate SG1 is owned by Gekko Productions, and MGM productions.